Lutheran Summer Music, a four-week summer music training program founded in 1982, returns to the Gustavus Adolphus College campus June 23 – July 20. More than 150 young musicians and an outstanding faculty of artists and musicians from across the United States will take part in this intensive educational session and present more than 20 recitals and concerts on the campus during the course of the month. Each event on the schedule is open to the public at no cost. A free-will offering will be taken to help defray some expenses. The schedule of events includes performances by faculty, guest artists, students and student ensembles nearly every day of the camp. This summer’s guest artists include the Rose Ensemble, the Praetorius Brass Quintet, Sine Nomine Vocal Ensemble and the Movere Woodwind Quintet. In addition, Lutheran Summer Music is pleased to collaborate this summer with members of the Minnesota All-State Lutheran Choir in a special concert in Christ Chapel at 7:00 p.m., Tuesday, July 1. 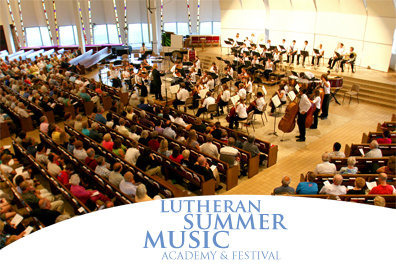 For a complete schedule or up-to-date information regarding public performances at Lutheran Summer Music, please call the summer office at 507-933-7741 or log-on at www.lutheransummermusic.org.